Typography's renaissance just keeps going from strength to strength, and as I've discussed elsewhere on this blog, type treatments for movies have always produced innovative work. For instance, Neville Brody and his Research Studios have just designed a very cool bespoke typeface for the new Michael Mann movie 'Public Enemies', which gets its UK release on July 1st. The film is based on the life of Chicago gangster John Dillinger, with Johnny Depp playing the infamous American anti-hero. 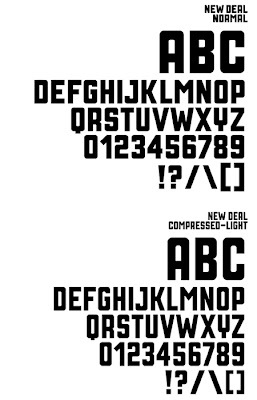 As for the typeface, it's a font called 'New Deal', a direct reference to President Roosevelt's New Deal programs, initiated in the mid-1930s. Research Studios have obviously explored the streamlined shapes of cars and trains from that era, as well as the architecture of the period, and the emergence of pulp fiction, to produce a Soviet-looking sans serif type with a contemporary industrial edge to it. It's a great example of how important it is to have a broad knowledge of the history and development of visual communication. It's retro cool and perfect for the subject matter. We can only hope the film itself is equally as good.